We're back once again for another edition of Ready For The Weekend where we look at a small portion of the professional wrestling events taking place in the UK. This week we head to Liverpool, Prestwich and Manchester. Let's Get Ready For The Weekend! Starting the weekend off on Friday night and Infinite Promotions are back at The Dome in Liverpool with In Your Scouse: We Can Fight It Out. The main event for the evening has already been announced as Danny Hope defending the Infinite Promotions Heavyweight Championship against Dylan Roberts. After winning a number one contender tournament, Roberts received a championship opportunity, but it was part of a four-way elimination match, not one on one. Understandably, this did not please Roberts in the slightest, now he has the chance he feels he was denied. While Hope will want to get his new championship reign off to a winning start, he faces a big first challenge in Roberts. From one champion to a former champion in the shape of Joey Hayes. After being the first out in the previously mentioned championship four-way match, Hayes will look to get back in winning ways. His opponent for the night shall be former WWE and current TNA star, Mr Anderson. Hayes needs to show he deserves a shot at becoming champion again and a win over a multi-time champion in Anderson shall certainly go in his favour. While the fans of Infinite Promotions have their favourites, one man who is up there with the best is Disco Bert. While Bert is still young in his career, his opponent, Rampage Brown has a wealth of experience as a world-traveled competitor. However is terms of success in Infinite Promotions, Bert outweighs Brown. That being said, Brown should not be and will not be underestimated by Bert. Brown will have his sights set on making 2016 his year in Infinite Promotions and cooling the fever that Bert has created would be a great start. Moving on to Saturday and Futureshock Wrestling host the latest installment of their Underground events at The Longfield Suite in Prestwich. One match that stemmed from Futureshock's last event is a tag team match, as Soner Dursun & Sam Bailey against DDL & Cyanide. Dursun was the victim of an attack from DDL and returning Cyanide. The former Adrenaline Champion has called on the help of former Futureshock Champion, Sam Bailey to gain a measure of retribution against Cyanide & DDL. Zack Gibson is a man who controls his own destiny in Futureshock, as the current holder of the Trophy Tournament, he has a guaranteed championship match at any time he chooses. However his opponent, Mikey Whiplash is a man who is making his own waves in Futureshock Wrestling right now. While Gibson may have guaranteed championship match, Whiplash is also in pursuit of the gold. A win over the current Trophy Tournament winner would go a big way to putting Mikey Whiplash closer to the championship. The main event on Saturday will see T-Bone defend the Futureshock Championship against Marc Massa. Massa has been getting involved in the business of T-Bone for a number of months and the champion wants to deal with the issue even going as far as putting his championship on the line. Massa might well find out that he has bitten off more than he can chew or he may have made the champion play right into his hands. Finally the weekend finishes up at The Ritz in Manchester as PROGRESS Wrestling return for Chapter 26: Unknown Pleasures. PROGRESSkicked off their announcements for the show in a big way by announcing that Jack Gallagher would face EVOLVE regular Timothy Thatcher on February 14th. The match shall be a true showcase of the British Wrestling style as both men are experts in the field. Anyone who has been following the ENDVR events will know, Pollyanna and Dahlia Black have had their run-ins over the past few months. That escalated when Dahlia Black's partner, TK Cooper punched Pollyanna in the face at a recent ENDVR event. If that wasn't bad enough, it happened again at Chapter 25. Now Pollyanna has had enough and wants revenge. So at Unknown Pleasures we will see The South Pacific Power Couple of Dahlia & Cooper face Pollyanna & 'Flash' Morgan Webster. The main event for 'Chapter 26: Unknown Pleasures' will see 'The Villain' Marty Scurll defend the PROGRESS Championship for the first time against the number one contender, 'The Star Attraction' Mark Haskins. Scurll has used his vicious streak to propel him back to the top of the mountain in PROGRESS Wrestling, dethroning Will Ospreay at Chapter 25. However now he is at the top, the target is on his back. The first man taking his shot is The Star Attraction. A man who hasn't lost in PROGRESS since his last shot at the title at Chapter 21, in September of last year. Haskins became the number one contender by defeating the only man who could come close to his undefeated streak, Zack Gibson. 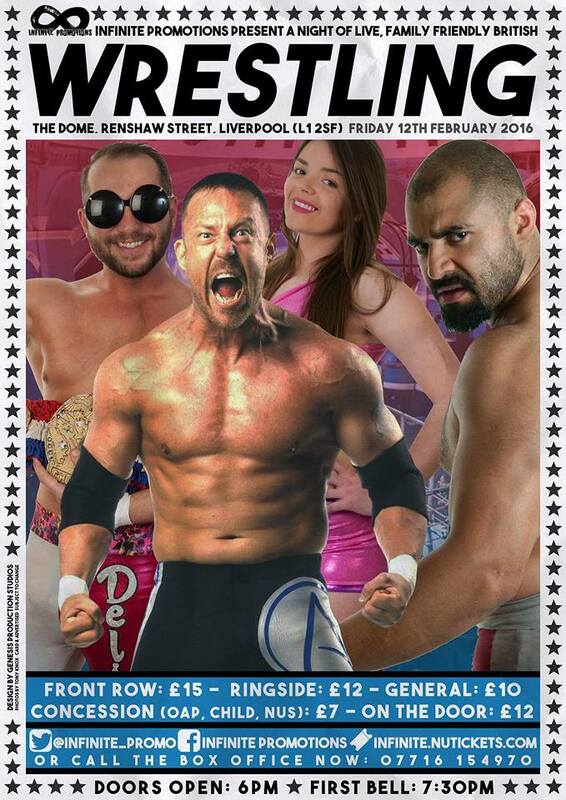 Haskins desire for the PROGRESS Championship rivals Marty Scurll's. Now we need to find out who wants it just that little bit more.